From Highway 99 take Highway 140 east 35 miles to Yaqui Gulch Road. Turn right on Yaqui Gulch. Go 3 miles to stop sign. Go across street (Yaqui Gulch turns into Buckeye Road). Follow Buckeye Road approximately 1.3 miles to Buckeye Creek Road. Turn left onto Buckeye Creek. 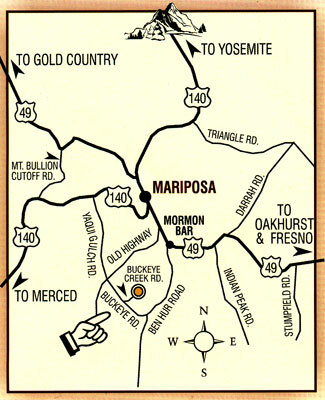 From Fresno, take Highway 41 north to Oakhurst. From Oakhurst, take Highway 49 north. Go 30 miles to Ben Hur Road. Turn left onto Ben Hur. Follow Ben Hur 4 miles to Buckeye Road. Turn right onto Buckeye Road 1.1 miles to Buckeye Creek Road. Turn right onto Buckeye Creek.